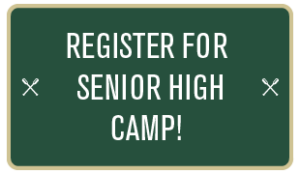 Sr. High Camp is for campers going in to grades 11 and 12 next year, or are graduating this Spring. This seven night session takes everything we do at camp and rolls into to one action packed week. These campers continue to learn leadership, friendship, responsibility, and the love of God during this session. The cost for this camp session is $675 per camper and includes registration, meals, canteen, milk and cookies, camp t-shirt, and camp picture.